211 Bernard: New and notable: 5 exciting titles! 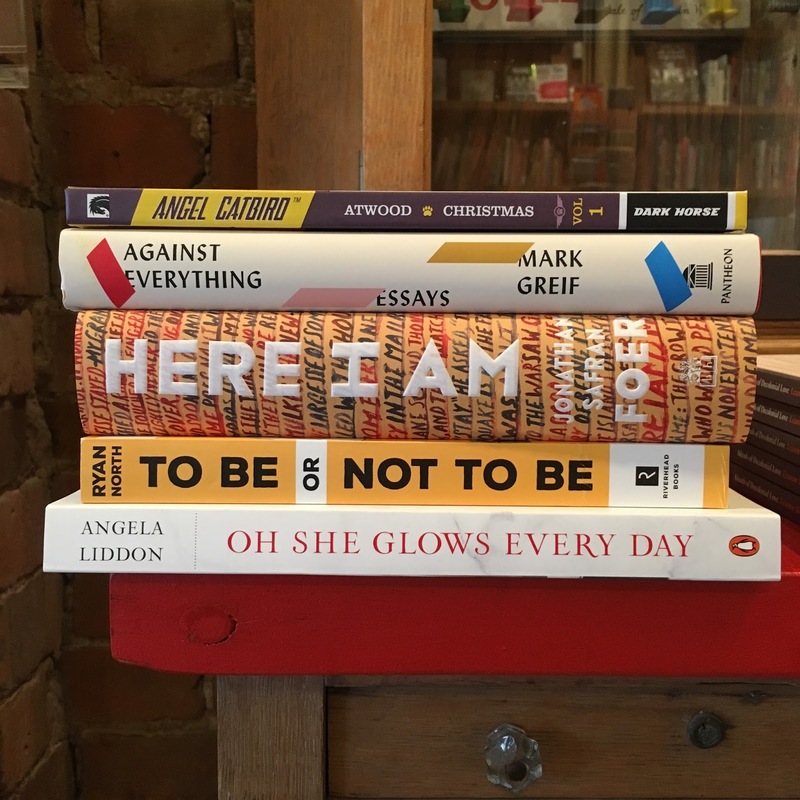 New and notable: 5 exciting titles! Today was a big receiving day: a number of anticipated titles arrived all at once! Margaret Atwood wrote a superhero comic book! It's called Angel Catbird and it's about a genetic engineer whose DNA gets merged with a cat and an owl. Humorous, pulp-inspired action ensues, with lots of cat puns. Mark Greif, one of the founding editors of acclaimed literary magazine n+1, has a new collection of essays. Entitled Against Everything, Greif addresses contemporary topics like the tyranny of exercise, food snobbery, the crisis of policing, the impact of the Occupy movement, and the demise of the hipster, with a contrarian intelligence that has earned him comparisons to figures as diverse as Susan Sontag and Henry David Thoreau. The title of Jonathan Safran Foer's Here I Am seems to acknowledge the long wait that preceded it: it's been eleven years since his last novel, Extremely Loud and Incredibly Close, and Foer, once a darling of the early-2000s McSweeney's set, seems to have dropped some of the whimsical narrative flourishes of his earlier work in favour of a more realistic tale that sets a failing middle-class Jewish-American marriage against the fate of the state of Israel. Ryan North (celebrated for his work on the deadpan Dinosaur Comics, as well as Marvel's Squirrel Girl and Adventure Time comics), has followed up his first choose-your-own-adventure adaptation of Romeo and Juliet incredibly fast. To Be or Not to Be, his second Shakespearian romp for young readers, comes only months after the release of its predecessor, with illustrations from dozens of comics luminaries. Angela Liddon’s The Oh She Glows Everyday Cookbook is the hotly anticipated follow-up to the New York Times bestseller The Oh She Glows Cookbook. Her new title features more than one hundred easy-to-make whole-foods and plant-based recipes to keep you glowing every day of the year.